Good photography takes patience; patience to stick around for the right moment, to consider technical details, to fine tune compositions, and to edit images with care. Yet sometimes the allure of trying to capture more images, or the long waits for the perfect light, can put that patience to the test. Surely every photographer has a story of giving up on a shot just a bit too early. One of my personal favorites is from last year, when I went shooting at Jay Cooke State Park with Jeremiah Cunningham. 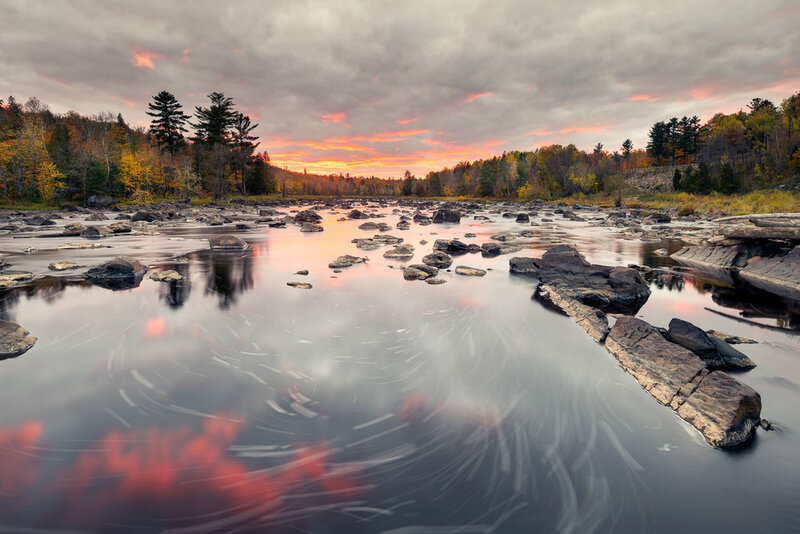 We carefully climbed down a steep bank and boulder-hopped through tall, thick grasses, until we got to a fairly flat rock on the Saint Louis River. We set up our tripods and waited for sunset for about an hour. After shooting what we deemed a lackluster sunset, we slowly climbed back up the hill and put our gear in the car. The second we slammed the trunk shut, as if on cue, the whole sky turned intensely magenta. After a brief hesitation, we found ourselves running down the hill, throwing caution to the wind. It’s a miracle neither of us turned an ankle – or worse. After the mad scramble down, I set up the shot as quickly as possible, trying to recreate the composition I had so carefully planned before (this is the exact opposite of a slow photography moment). We both got a shot, but we missed the most spectacular light. Experiences like these have cumulatively made the lesson sink in: wait just a little bit longer. 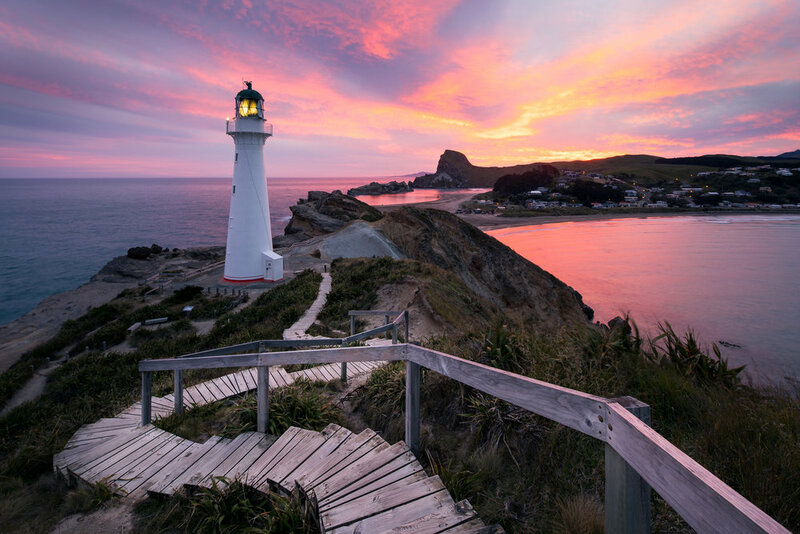 My learned willingness to wait has paid off multiple times, including when I shot the Castle Point Lighthouse in New Zealand. My wife and I took a three-hour detour specifically to shoot this location at sunset, before driving to Wellington that night. I found the perfect composition, set up my manual-focus tilt-shift lens just how I wanted it, and waited. The skies were dull grey without a single hint of color in the direction of sunset. There were two other photographers there, also hoping for some light to appear. I told them I didn’t think it was going to happen and they agreed it didn’t look promising. Even so, we all waited until sunset time. Still nothing happened. The other two resigned, packed up their things, and left. They were probably just a few minutes into their drive when, amazingly, the sky lit up into one of the most magnificent sunsets I have ever seen. I was the only photographer there! I hope they were already driving through the mountains, covered by the foliage, so that they didn’t have to realize what was happening; it would have been so painful! Often though, the wait may seem to be in vain – the dramatic light doesn’t always materialize. This means we must learn to be ok with going home without a shot, and reinforces the importance of focusing on the experience. In many cases, an alternative is to forget about the iconic landscape shot and look for other things to feature, maybe things for which you’re less at the mercy of Mother Nature. Jennifer Renwick’s entry on slowing down at Yellowstone National Park is a great read on this topic. Staying a little longer may also allow you to see the subject differently, even if the dramatic light you’re hoping for never arrives. 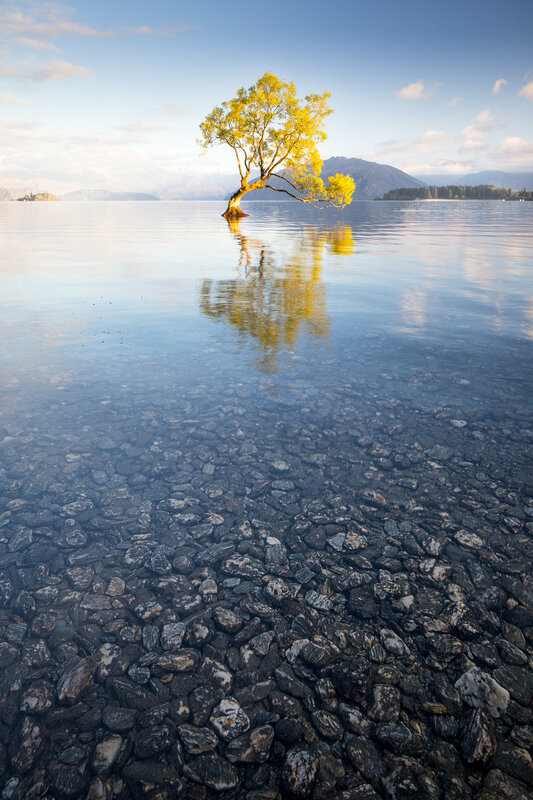 The morning I spent at the famous Wanaka Tree was crowded with photographers. There were at least 20 there, all lined up along the shore like soldiers, pointing a varied array of lenses at this social media icon. I was set up near the middle, taking care not to block others, and doing my best to compose an elegant shot. The morning light was subtle and muted, but I got a decent exposure of the tree silhouette at dawn (cover image for this article). I captured my image when the wake from a kayaker created some interest in the water. Conversing with others and comparing our images though, it seemed most of our shots were fairly similar. A little later, once the sun hit the tree and the blue hour light was gone, most photographers disappeared. It had not been a particularly dramatic sunrise, and there was some disappointment expressed by a few. How can you compete with all the magnificent shots of this tree that are already out there, from mornings or evenings when the sky was on fire? I stuck around a little longer, observing the tree, and playing with different ways to frame it. I tried multiple lenses, angles, tripod heights, etc. Now that I was almost alone, I was able to walk into the water without disturbing anyone else’s shot, and just like that I saw what I thought was a better – or at least more unique – image. The beautiful pebbles in the water, as a foreground leading up to the now brightly illuminated tree, were hard to perceive from the shore. A few steps into the water and I was composing a completely different shot. I was reminded yet again that it’s not about competition with others; it’s about finding your own way to experience a place. Ultimately, I felt that my morning at the tree ended positively, unlike those who may have walked away disappointed. Waiting with crossed fingers for the possibility that Mother Nature will deliver a show is often a good enough reason to stick around. Yet I believe there is another, maybe better reason to practice patience as a photographer, one that presents a good creative challenge. It is the potential to see and frame your subject completely differently, or even find new and unexpected subjects nearby. Ultimately, sticking around my subjects just a little bit longer is one of the best ways I’ve found to improve my chances of coming home with better images, and more importantly, a better experience. Ernesto is a proud Puerto Rican who relocated to MN to study architecture. He lives in the Twin Cities with his wife where he also enjoys boating, dancing, camping, and as much travel as possible. His interest in photography was born in 1994 when he bought an EOS Rebel S for a student trip to Europe. Twenty years later he bought his first full frame DSLR and recommitted himself to pursue his passion for photography, focusing on travel and nature images. His emphasis on quality over quantity and on enjoying the experience were driving forces behind the formation of this collaborative movement.